Fremont Glass and Garage Door at 607 Main St. in Fremont, is a family-owned business that has grown from a one-man shop to employing both full-time and part-time workers. Michael and Deborah Caputo have run their business for 20 years with pride and service, and primarily cover Rockingham Country, although they will travel all over New Hampshire and to both Massachusetts and Maine. The company opened for business in 1997. The couple started out by selling their motorcycle to set up shop in their 26-foot by 26-foot garage and began working on glass and garage doors, work Michael had been doing since he was 18. They saw a need for their services in the area and were proven right, as the company is still growing after 20 years. Deborah Caputo said the company got off to rough start with their truck catching fire, but they persevered. They both had full-time jobs when the company started, she as a teacher and he in maintenance. Deborah said the business grew so rapidly in its first two years that she left teaching to run the office; her husband was by then working on the glass and garage doors. Things have come full circle now, she said, noting that "Mike is discovering he is installing new garage doors to replace doors he originally installed when he was working for a company out of Haverhill back when he was 18." Deborah said that while the main part of their business involves garage doors and garage door openers, they do a lot with window glass replacement, shower glass, mirrors, and replacement of window glass that has become foggy. "We do a lot of safety glass and fireplace glass and table tops, and carriage house doors are popular," she said. "We have a full glass shop in the garage that has grown to be 70 feet long. We have stayed right here where we started. We service both residential and commercial in both of our product areas." 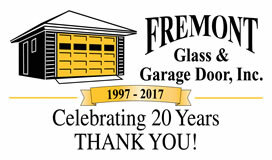 Included in the customer service and personal approach the company bring to their business, Fremont Glass and Garage Door provides free estimates; has showrooms in two locations; is run by a friendly, knowledgeable staff; and uses only quality, professional grade products. "We have a Facebook page and I run the office and do everything that needs to be done," she said. And their advertisement says it all: "With over 35 years of experience, there's no one that you can trust more than Fremont Glass & Garage Door, Inc. for all of your glass and garage door needs." Deborah said a celebration of their 20-year business anniversary is being planned. Reach Fremont Glass at 895-0763 (phone), 895-0944 (fax) or email at debbie@fremontglassandgaragedoor.comcastbiz.net.